I am a distant relative of the bichon, but my coat comes in lots of other colors besides white. I also don't need much help in keeping it looking good, because it doesn't need to be clipped in any special fashion. My body might look delicate, but I am a hardy, chipper little character with strong, purposeful movements. I am gentle natured, inquisitive, and most agreeable to have around -- and, unlike some of the other toy breeds that I will not mention, I really like children! When fully grown, I am between 8 and 11 inches tall (20.3 to 27.9 centimeters) and I weigh between 7 and 12 pounds (3.2 to 5.4 kilograms). 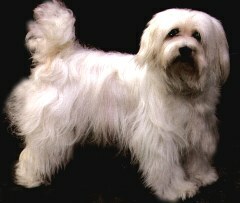 We have no Havanese Breeders listed at this time. Click here to place your Havanese Ad!